It’s quite amazing, isn’t it, that we as a culture have traveled from celebrating the likes of Audi Murphy to having a presidential administration lauding as honorable Bowe Bergdahl, a man who deserted his post and deliberately sought out the enemy. George MacDonald Fraser’s delightful Quartered Safe Out Here: A Harrowing Tale of World War II , describing an infantry man’s experiences in Burma during WWII, may offer an answer. Fraser’s autobiography isn’t concerned with the big picture, although he references it when he needs to give necessary context. Instead, looking back over 50 years, Fraser attempts to revisit his impressions of the very small world he inhabited, consisting of his unit and those other men, both friend of foe, with which his unit intersected. It is a very accessible memoir. Fraser’s description of his first battle and its aftermath is especially interesting. He describes how, within a minute or two, half his unit was wounded, and two men were dead. Despite these events, Fraser writes that he was able to function because he’d shifted into a battle mode that allowed him to observe what was happening, to make decisions, and to act, all without emotion overwhelming him. After the battle ended, Fraser writes that the men in the unit, both wounded and whole, were neither exultant nor despairing. They were just tired. They didn’t obsess about the dead but, instead, engaged in a respectful ritual that saw each of them exchange a piece of his military, non-personal kit for that of the dead man’s military, non-personal kit. There was no greed involved, nor was the experience maudlin. Instead, the ritual was an almost businesslike way to remember the dead by keeping something of his nearby. An outsider might have thought, mistakenly, that the section was unmoved by the deaths of Gale and Little. There was no outward show of sorrow, no reminiscences or eulogies, no Hollywood heart-searchings or phony philosophy. Forster asked “W’ee’s on foorst stag?”; Grandarse said “Not me, any roads; Ah’s aboot knackered”, and rolled up in his blanket; Nick cleaned Tich’s rifle; I washed and dried his pialla; the new section commander – that young corporal who earlier in the day had earned the Military Medal — told off the stag roster; we went to sleep. And that was that. It was not callousness or indifference or lack of feeling for two comrades who had been alive that morning and were now names for the war memorial; it was just that there was nothing to be said. It was part of war; men died, more would die, that was past, and what mattered now was the business in hand; those who lived would get on with it. Whatever sorrow was felt, there was no point in talking or brooding about it, much less in making, for form’s sake, a parade of it. Better and healthier to forget it, and look to tomorrow. The celebrated British stiff upper lip, the resolve to conceal emotion which is not only embarrassing and useless, but harmful, is just plain common sense. But that was half a century ago. Things are different now, when the media seem to feel they have a duty to dwell on emotion, the more harrowing the better, and to encourage its indulgence. The cameras close on stricken families at funerals, interviewers probe relentlessly to uncover grief, pain, fear, and shock, know no reticence or even decency in their eagerness to make the viewers’ flesh creep, and wallow in the sentimental cliché (victims are always “innocent”, relatives must be “loved ones”). And the obscene intrusion is justified as “caring” and “compassionate” when it is the exact opposite. The pity is that the public shapes its behaviour to the media’s demands. The bereaved feel obliged to weep and lament for the cameras (and feel a flattering importance at their attention). Even young soldiers, on the eye of action in the Gulf, confessed, under a nauseating inquisition designed to uncover their fears, to being frightened — of course they were frightened, just as we were, but no interviewer in our time was so shameless, cruel, or unpatriotic as to badger us into admitting our human weakness for public consumption, and thereby undermining public morale, and our own. In such a climate, it is not to be wondered at that a general should agonise publicly about the fears and soul-searchings of command — Slim and Montgomery and MacArthur had them, too, but they would rather have been shot than admit it. They knew the value of the stiff upper lip. The damage that fashionable attitudes, reflected (and created) by television, have done to the public spirit, is incalculable. It has been weakened to the point where it is taken for granted that anyone who has suffered loss and hardship must be in need of “counselling”; that soldiers will suffer from “post-battle traumatic stress” and need psychiatric help. One wonders how Londoners survived the Blitz without the interference of unqualified, jargonmumbling “counsellors”, or how an overwhelming number of 1940s servicemen returned successfully to civilian life without benefit of brain-washing. Certainly, a small minority needed help; war can leave terrible mental scars — but the numbers will increase, and the scars enlarge, in proportion to society’s insistence on raising spectres which would be better left alone. Tell people they should feel something, and they’ll not only feel it, they’ll regard themselves as entitled and obliged to feel it. (Quartered Safe Out Here: A Harrowing Tale of World War II (Skyhorse Publishing. Kindle Edition), pp. 88-90.) Good, isn’t it? It also reads as interesting prelude to Britain’s mass hysteria when Princess Diana died. But I digress. Fraser’s right, of course, about the way in which our Oprah-ized society weakens people. Even before Oprah came along to make a profit by turning everyone into an emotional victim, Wendy Kaminer was describing it in her acerbic, interesting book, I’m Dysfunctional, You’re Dysfunctional: The Recovery Movement and Other Self-Help . In it, Kaminer juxtaposed women’s encounter groups that encouraged each women to recognize herself as a victim of the American patriarchy, with the experiences of women who had escaped from Vietnam and Cambodia, and just wanted to get on with their lives. A therapeutic culture is, by definition, a mentally sick one. What Fraser’s analysis necessarily misses, because he was in England, not America, is that America went through an intermediate stage regarding the troops, between reverence and condescension, and that this intermediate stage goes a long way to explaining the current bathos that oozes from the media and Hollywood. We, after all, had Vietnam. During the Vietnam era, Leftists reframed America’s view of soldiers. They were no longer ordinary men and women called upon to defend their country, who tapped into their innate physical, mental, and emotional strength to do so. Instead, America’s troops were murderous psychopaths who came home either as deranged psychopaths or as drugged-out psychopaths. The Vietnam vet slander also fell apart with people like me, whose father’s were to old for the Vietnam war, and whose peers were too young. We looked at our WWII-era fathers and his friends, and thought “World War II was just as bad as, if not worse than, the Vietnam war. Why are my Dad and his generation normal, while the Vietnam vets are not?” The obvious answer, after looking at actual, rather than Hollywood-ized, Vietnam vets, is that they were just as normal or abnormal as our father’s generation, or as any generation. Put another way, Vietnam vets are and were normal. It was the media’s and Hollywood’s take on them that was abnormal. This realization meant that Leftists could no longer use demonizing the troops as an anti-War tactic. They had to come up with something else, and the therapeutic culture offers just what they needed: America’s troops were recast, not as citizen soldiers, but as soldier victims. Each and every one is a sensitive soul who is traumatized merely by donning the uniform, never mind actually having to fight, survive, and kill. Having created the template, the media must then repeatedly revisit each soldier’s trauma in order to heal the military’s collective angst. Under the new view, which Fraser so disdainfully articulates, our troops aren’t heroes, they’re victims. Indeed, we use the word “hero” to describe, not the winning fighters, but those men and women who have suffered overwhelming psychic injury merely because they were forced to wear that cruel uniform. 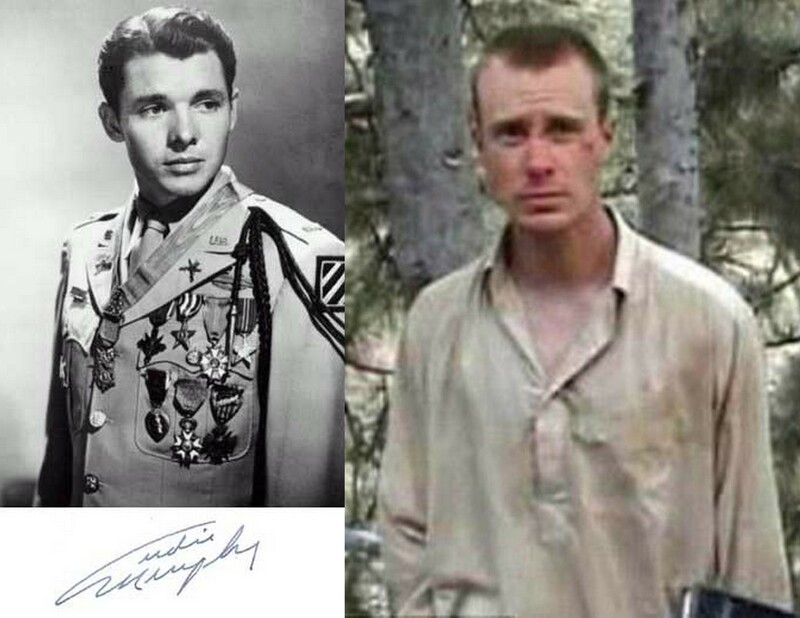 And that, my friends, is how we moved from being a culture that celebrated Audie Murphy’s actual heroism, to being a culture whose president celebrates as heroism the mere fact that Bowe Bergdahl donned a uniform — never mind that he never did anything remotely heroic while he wore it, and that he then stripped that uniform from his body and hied himself off to the enemy.